For the record, my parents are the best photographers I know. I have them to thank for this hobby, and any skills I may have developed were surely built on the foundation they provided. It wasn't a formal training; just hours of flipping through books of prints, and later through Jpegs, picking out the keepers from the day's catch of shots. 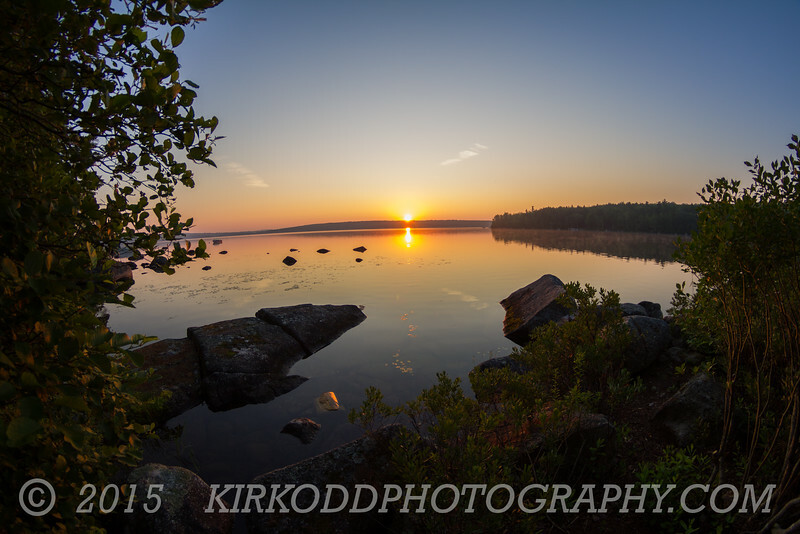 This beautiful shot of a sunrise on Branch Lake in Ellsworth, Maine may have been recorded by my camera, but it wasn't me who pulled the trigger this time. While I was sleeping in, overly tired from a sleepless night thanks to my adorable 8 month old boy, my dad was lining up this beautiful sunrise. I had the 8mm fish eye on the camera body from the previous night's attempts at capturing the night sky, and my dad hadn't bothered to change it out. That's why the horizon possesses a slight downward curving distortion. When my dad graciously offered this photo up to Kirsten and myself for our business, I thought about taking out the curve in post processing. However, my dad figured it looked better this way. Who am I to argue? After all, we really do live on a tiny celestial sphere. A long time ago, way up above this fragile marble, it was once said...Let There Be Light! Good, isn't it?